It wouldn’t be much of a stretch to assume that anyone reading Hackaday regularly has at least progressed to the point where they can connect an LED to a microcontroller and get it to blink without setting anything on fire. We won’t even chastise you for not doing it with a 555 timer. It’s also not a stretch to say if you can successfully put together the “Hello World” of modern electronics on a breadboard, you’re well on the way to adding a few more LEDs, some sensors, and a couple buttons to that microcontroller and producing something that might come dangerously close to a useful gadget. Hardware hacking sneaks up on you like that. Here’s where it gets tricky: how many of us are still stuck at that point? Don’t be shy, there’s no shame in it. A large chunk of the “completed” projects that grace these pages are still on breadboards, and if we had to pass on every project that still had a full-on development board like the Arduino or Wemos D1 at its heart…well, let’s just say it wouldn’t be pretty. Of course, if you’re just building something as a personal project, there’s often little advantage to having a PCB spun up or building a custom enclosure. But what happens when you want to build more than one? If you’ve got an idea worth putting into production, you’ve got to approach the problem with a bit more finesse. Especially if you’re looking to turn a profit on the venture. At the recent WOPR Summit in Atlantic City, there were a pair of presentations which dealt specifically with taking your hardware designs to the next level. Russell Handorf and Mike Kershaw hosted an epic four hour workshop called Strategies for your Projects: Concept to Prototype and El Kentaro gave a fascinating talk about his design process called Being Q: Designing Hacking Gadgets which together tackled both the practical and somewhat more philosophical aspects of building hardware for an audience larger than just yourself. At the start of Strategies for your Projects: Concept to Prototype, one thing is made abundantly clear: you don’t need to be a professional engineer to design hardware fit for manufacture. There’s such an incredible wealth of information online in the form of tutorials or YouTube videos that learning the basics is really easier than ever. Just checking out the latest projects and techniques here on Hackaday is already a good start. The most important thing is to start simple, and work your way up. 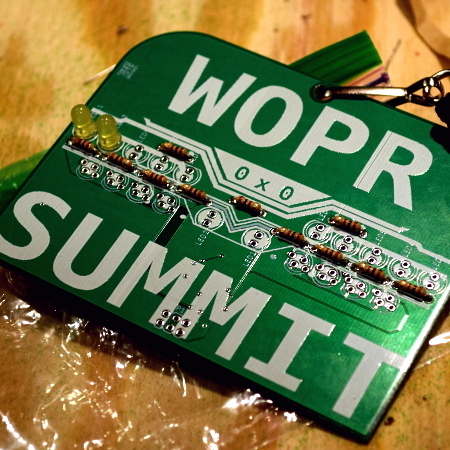 The WOPR Summit badge itself was often used as an example during the workshop. Its relatively simple design, low part count, and combination of through-hole and surface mount construction gave attendees an up close and personal look at an entry level project they should be able to pull off without too much trouble. Having this handy reference point around the necks of everyone in the audience wasn’t just happenstance; Russell and Mike were the official “badge guys” for WOPR Summit, so they did have a bit of insider knowledge. Throughout the workshop, the two took turns at the podium to talk about, well, everything. From reading datasheets to sourcing components, Mike and Russell had opinions on it all. A lot of time was spent talking about the different form factors for electronic components, and the pros and cons of each. If you’re just building for your own purposes you can do what you want, but if you’re trying to put the design into production, you’re really going to need to bite the bullet and get comfortable with surface mount. After you know what kind of parts you’ll be using, you need to source them. Here again, the duo offered some guidance from their combined experience building hardware gadgets. While the lowest price you can find for “jellybean” parts like LEDs and resistors is usually fine, they cautioned against similar shopping habits with more advanced components. Stick with reputable distributors like Digikey, Mouser, Element14, and don’t buy anything that seems to be far below market value. With the prevalence of fake or salvaged parts on the market, especially when dealing with overseas suppliers, it’s not worth taking the risk just to save a few dollars. That being said, it’s often significantly cheaper to buy larger quantities of parts than you actually need, so don’t be afraid to add a couple zeros to the “Quantity” field if the price is right. Another key point in the workshop was that you shouldn’t be afraid to use turn-key modules instead of trying to reinvent the wheel. No, that doesn’t mean leaving an Arduino inside your commercial product. But rather than trying to develop your own WiFi module or LiPo charger circuit, leverage the fact that somebody has already done the hard work for you. You’re not going to build a better WiFi module than the ESP8266, so don’t waste your time trying; just design your PCB with pads so the module can be soldered on. We even see this in commercial products from time to time. It’s true that modules are usually the more expensive route, and fabrication houses dislike them because they can make the design more difficult to assemble, but the bump in cost is worth it to keep your sanity. As far as hardware talks go, Being Q: Designing Hacking Gadgets was pretty unique. There was almost no mention of actual electronic components, and nary a soldering iron in sight. But what it did have was quotes from Frank Lloyd Wright, and a particularly dogeared copy of Robert Wallace’s Spycraft. From the start, El Kentaro promised a unique look at hardware design, and he definitely delivered. His entire talk was predicated on two core concepts: that the design of a device should do exactly what the user needs it to do, and that it should look as cool as possible while doing it. El Kentaro has always been inspired by the gadgets used in the James Bond films; hardware which not only seems to be perfectly suited to whatever mission the suave secret agent was on at that moment, but also managed to have an air of style and sophistication to rival 007 himself. 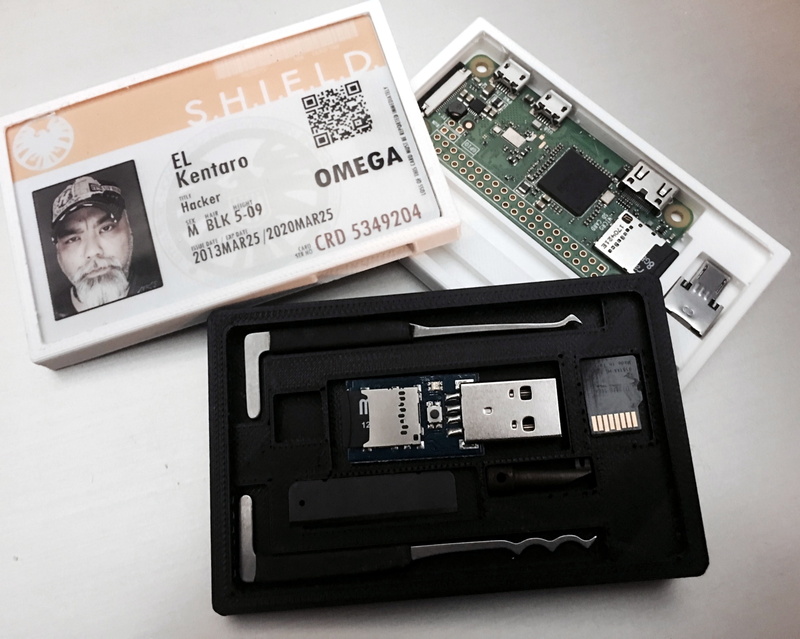 These principles inspired him to create things like the “Hacker Pass Case”, a 3D printed kit designed to hold a Raspberry Pi Zero, a lockpick set, and other assorted bits and bobs the 21st century spy might need. In fact, many of the designs he showed off during the presentation could be reasonably described as largely off the shelf components housed in clever 3D printed enclosures. He recalled a particularly interesting project where an exceptionally dedicated security researcher asked him to design a printed enclosure which would allow them to sneak a Raspberry Pi Zero into a facility where they would be thoroughly searched. Visualizing the mechanics of such a device will be left as an exercise for the reader, but let’s just say it’s a good thing the Pi Zero is so small. While the talk mainly focused on the external look and feel of the gadgets he designs, El Kentaro did have a few words of wisdom that mirrored what Mike and Russell had said earlier in the day. Namely, be very careful when sourcing your components. 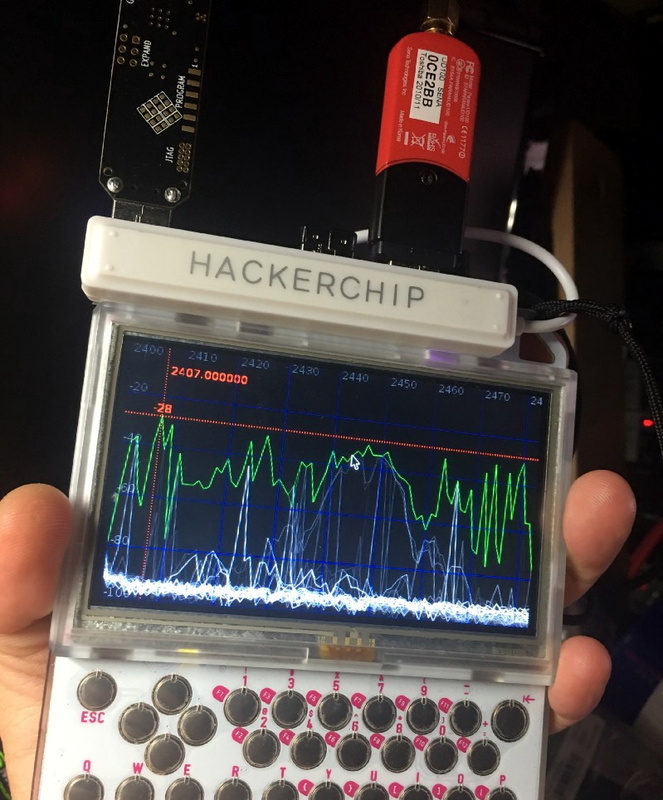 He told those in attendance about his HackerChip project, which aimed to turn the diminutive $9 Linux computer into a mobile penetration testing toolkit. The project gained popularity, but as readers of Hackaday will no doubt recall, the company which was producing the C.H.I.P went under and prices for the computer on the second hand market skyrocketed. Now he says he doesn’t use anything that can’t be sourced on Amazon for designs he plans on releasing to the public. It being their first year, the WOPR Summit didn’t have any recording setup this time around for the presentations. That’s always unfortunate, as there’s really no substitute for being able to see these individuals speak about subjects they’re truly passionate about. Though to be fair, a four hour workshop wouldn’t translate particularly well to YouTube. To that end, anyone who wants to get serious about building something amazing would do well to attend these types of events in person. Even if there’s no hacker or hardware design conventions in your area, see if there’s at least a hackerspace within a reasonable distance. It’s true that the Internet holds an incredible amount of information on literally every subject imaginable, but sometimes it pays to come out of your comfort zone and meet some folks face to face. You might be surprised by what you learn, or maybe, by what you teach. If the project point can absorb it, why not. On a separate note, did I really read that [elKentaro] hid a Raspberry Pi in a **** plug?! There’s a reason they call it penetration testing, and THAT ISN’T IT! I’d like to amplify that point. Under some conditions of volume, price, and time-to-market, using a “full-on development board like the Arduino or Wemos D1” in a product makes sense. If you’re making 10 of them, maybe. But not when you’re making thousands, or hundreds of thousands. That’s the whole point. Even if the price was the same, you wouldn’t want to hinge your entire project on the upstream supply of Arduinos or ESP boards. Personally I can think of nothing that would kill my interest in a project faster than making it all about scaling, design for manufacturing, BOM cost, etc. That’s what my day job is for! I like best the hacks which are as quirky and individual as their creators and can read all about ramping up volume and tweaking designs for bulk manufacturing elsewhere. Is it my imagination or has Hackaday recently started running a disproportionate number of articles about this productization path? I already killed one hobby by making it my day job and I, for one, sure as hell don’t want to do that again. It’s the theme for this year’s Hackaday Prize—I agree they do seem to be pushing it a bit hard though. Visit the Arduino forums – abd you’ll see a huge number of beginners that can’t blink a LED consistently ! It might actually be finished already, and if it is being shared, the recipient will need their own breadboard! I know Mike Kershaw as a programmer working at Marist, a school in New York State, he wrote the big blob that got most people their start in the ideas of running Linux on a S/390 (now System Z) box./ And he used Slackware Linux for it.